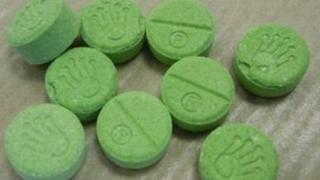 Police have issued a renewed warning about fake ecstasy pills in Northern Ireland known as 'green Rolexes'. It follows a number of small seizures of the tablets in recent days by police in County Antrim. Forensic analysis has revealed that other recently seized pills have been found to contain the highly toxic chemicals PMA and PMMA, as well as ecstasy. Police said there was no such thing as a "safe drug or dose". Earlier this month, the Health Minister Edwin Poots said two out of the eight recent sudden deaths of people in their 20s and their 30s in Northern Ireland may be linked to "green Rolexes". Detective Inspector Andy Dunlop of the PSNI's Organised Crime Branch said on Wednesday that "despite previous warnings by police and continued uncertainty surrounding the causes of a number of recent unexplained deaths, people are continuing to put their lives at risk". "The combination of MDMA (ecstasy) and PMA can be particularly hazardous to health and has been linked with numerous deaths world-wide," he added. "PMMA (paramethoxymethamphetamine) is particularly toxic. "Both dealers and users may be unaware that what they believe to be ecstasy, actually contains PMMA. "PMMA pills are slower to take effect. This may cause the user to take more - which can lead to seizures, convulsions, heart attack and ultimately death." Police have repeated warnings to members of the public. They said the chemicals had "also been found in numerous other coloured pills bearing different logos throughout Great Britain, Europe and in Canada". "They have been directly linked to death," they said. "Anyone found suffering ill-effects after having taken drugs should be treated as a medical emergency." Mr Poots had said other drugs were being examined in the investigations into the other six deaths. Seven of the eight deaths took place in the greater Belfast area, with the highest death toll in the east of the city. The eighth person died in Coleraine, County Londonderry.